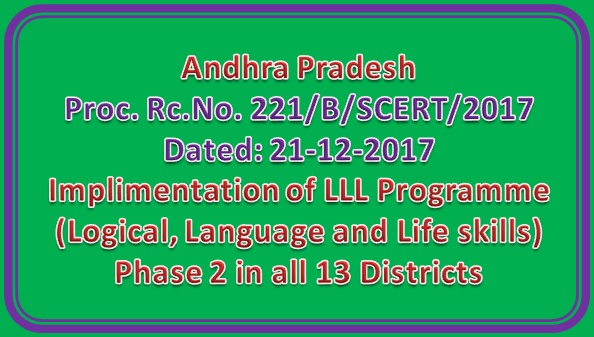 Proc Rc No 221 || Implimentation of LLL Programme (Logical, Language and Life skills) - Phase 2 in all 13 Districts of A.P. Sub: SCERT. AP. Amaravati - School Education Department- Implimentation of LLL Programme (Logical, Language and Life skills) in A.P. - Phase 2 in all 13 Districts of A.P. 2) R.C.No. 528/RMSA/2017 of Director R.M.S.A. dt. 16/06/2017. Our Shool Education Dept. A.P. decided to implement L.L.L. Programme which is designed by Vandemataram Foundation, which is innovative and much useful for children of Government schools and KGBVs. Children pertaining to 6th to 9th classes will get benefit by way of improving their basic numerical skills and reading abilities. At the same time this programme’s main emphasis is on improving logical skills, art and craft skills of the students. In this connection tr Phase II (Pilot) programme for 10 schools per each district are selected. Before the start of the implementation of phase 2 it is proposed to conduct one day work shop for Mathematics teachers. PETs and Head Masters of 130 schools on 3rd January at Sri Swami Narayan Gurukul International School. Ketanakonda. In this connection District Educational Officers of all Districts are requested to give proper instructiOnS to implement the LLL Programme from 23rd January onwards. And also give necessary instructions to all the concerned Head Masters to allot 2 periods every day for 40 working days. List of 130 schools from all Districts is enclosed herewith. The programme is for all students of 6th to 9th classes in the selected list of schools which is annexed with this.